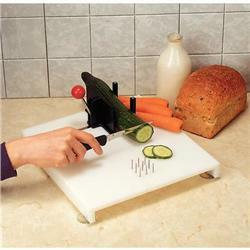 This durable cutting board is ideal for those who have difficulty in gripping, or only have the use of one hand. The clamp can fix items such as tins or bowls, and the stainless steel spikes keep vegetables still when peeling or cutting. It has four non-slip rubber feet to prevent the board from moving. Suction pads are also provided for use on wet surfaces.